Irishman Nicolas Roche will be the leader of the French AG2R team when the Tour de France begins in Rotterdam, The Netherlands this coming Saturday. Roche has been on the cusp of a big win for the past two seasons and, while a top placing in general classification along with the race favorites isn't realistic, team boss Vincent Lavenu thinks the 25 year old will be the team's best chance for overall success. Roche went home with second and third place finishes in stages last July, and will go into the race as one of the team's best chances for a stage win. "We know we won't be riding for overall victory at the Tour," Lavenu told French newspaper L'Equipe. "Nicolas Roche has ambitions in the general classification - measured ambitions of finishing in the top 15. Will will also hope that [Christophe] Riblon, [David] Le Lay, and [John] Gadret will be able to look for opportunities in the breaks." Lavenu waited to announce the composition of his Tour de France team until after the French national championships were contested. Rinaldo Nocentini, who wore the yellow jersey for eight days in last year's edition, has earned his ticket to The Netherlands the hard way. The Italian suffered a fractured tibia and fibula in March, and worked incredibly hard to recover in time for the Tour start in Holland. 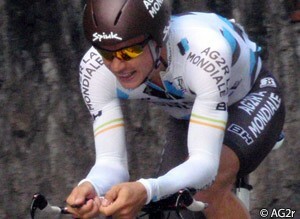 Newly minted Swiss time trial champion Martin Elmiger as well as Dimitri Champion have also been included on the team.